Looking at my watch list there are currently 12 stocks trading close to their 52-week low figure. This month, I'm trying to add a stock in the Industry sector, as I do not own any stock in this sector yet. There are a few possibilities I'd like to discuss with you! 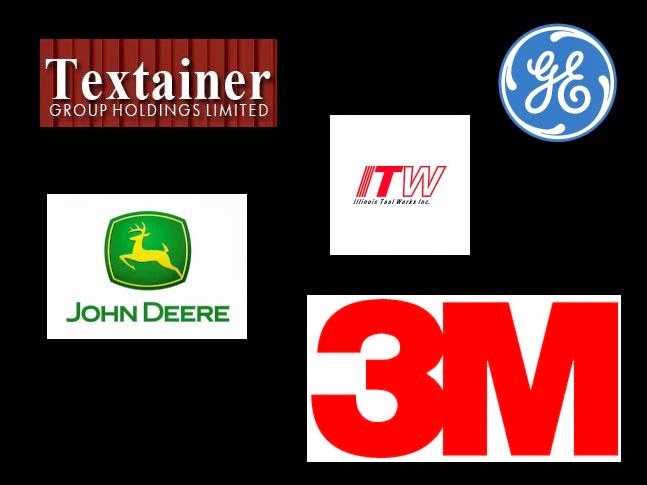 3M is a huge manufacturer of a wide range of industrial products. From Post-Its to petcare, this company owns a large number of well known brands. They have been raising their dividends for 57 years in a row! That sure sounds like music to my ears. The only disadvantage: it currently trades close to their 52-week high value. ITW is another global manufacturer of industrial products. They operate in segments like Automotive, Food Equipment & Construction Products. The company has been raising their dividends for 40 years in a row. Not too shabby! Founded in 1837, this company sure knows how to design and manufacture farm equipment. It is the largest agriculture machinery company in the world. Although they announced to lay off 600 of their employees in the US due to less demand of their products, I'm pretty confident they will find other ways in upcoming markets to increase their revenue. They have been raising their dividends for 11 years in a row. Textainer is a freight company managing containers. They sell, manage and lease containers to various shipping lines. With over 2 million containers in their fleet, this is one of the largest companies at their segment. During Q3 and Q4 in 2014 the stock went down from $40 to $28. As it is currently trading at $29, this should provide a very nice entry point. They have been raiding their dividends for 8 years in a row. General Electric is a diversified technology and financial services company. It serves customers in more than 100 countries. Their products and services range from power generation, water processing to medical imaging. The company has shown a steady growth over the last few years, but their 5 year growth number is very low. Despite the short 5 year streak of dividend raising, they have been paying dividends for 40 years now. This is another stock that's trading close to its 52-week low number. All of these companies look like solid investments to me, but when we compare some growth and yield stats, there are huge differences. I'm definitely looking for double digit growth numbers, so ITW will not be the winner here.